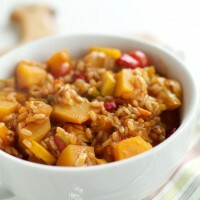 Butternut Squash Jambalaya (vegan) | Naturally.Butternut Squash Jambalaya (vegan) | Naturally. To prepare vegetables, peel and cut the butternut squash into 1/2″ cubes. Measure out roughly 3 cups and save the rest for use in another recipe. Dice the onion, peppers, celery, and tomatoes. In a large skillet, heat olive oil over medium heat. Add onions, peppers, and celery to oil. Cook onions until they begin to soften, about three minutes then add in garlic, squash, tomatoes. Continue to cook for 2-3 more minutes then pour in the Worcestershire sauce, hot sauce, and rice. Cook rice in mixture for 1-2 minutes before adding liquids. Finally, add remaining ingredients, bring to a boil, and reduce then to a simmer. Stir often until rice absorbed all the liquid (about 20-30 minutes- this really depends on your heat source) Remove from heat and serve.